The latest episode of FX’s Atlanta broadcast in the US stepped away from the central characters—rapper Paper Boi and his manager-cousin Earn, played by Donald Glover—for the first time and centered on Vanessa, the mother of Earn’s child. It was the first episode directed by Glover—the show’s star and creator—and he wanted to capture her point of view. Never having never directed a TV show before, he leaned on actress Zazie Beetz when directing her character’s facial expressions, as well as other people like the show’s director of photography Christian Sprenger. Glover’s focus on making the show feel right is part of what makes Atlanta unlike anything else on TV. It’s less about story and more about tone. As Glover has said, he wants Atlanta to show people what it feels like to be black. The show, which launched last month in the US on FX, has performed consistently well for a new scripted comedy. 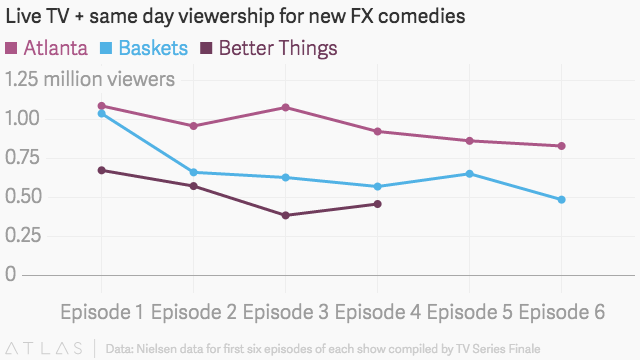 Its premiere had one of the highest viewership lifts for an FX comedy, behind Baskets, in the three days after it first aired. And 1.1 million people tuned into watch Atlanta’s first episode when it premiered on Sept. 6—a solid turnout for a scripted comedy in an era of time-shifted viewing. The show was renewed for a second season just two episodes into the first, which is fast in the TV world. Glover is holding off on making any big decisions about what’s next for the series until he hears how the audience responds to the first 10 episodes.